Given how remakes these days tend to be either terrible (Ocean’s) or terrific (Planet of the Apes), there were understandable shivers about how good or bad the fourth version of A Star is Born might be. Thankfully, the Movie God has smiled down upon this fabulous film, which turns out to be one of the year’s best crowd pleasers. Directed with an uncommon sureness of touch by first-timer Bradley Cooper, who also stars, the film features plenty of dramatic changes and nifty 21st-century updating but largely sticks pretty closely to the contours of the original William Wellman film (who also scores a credit here). All anxieties dissolve within about the first 10 minutes, the main one being whether Lady Gaga could hold her own in a dramatic role away from all the glitz and frippery that usually come attached to her like ill-fitting Transformer armour. 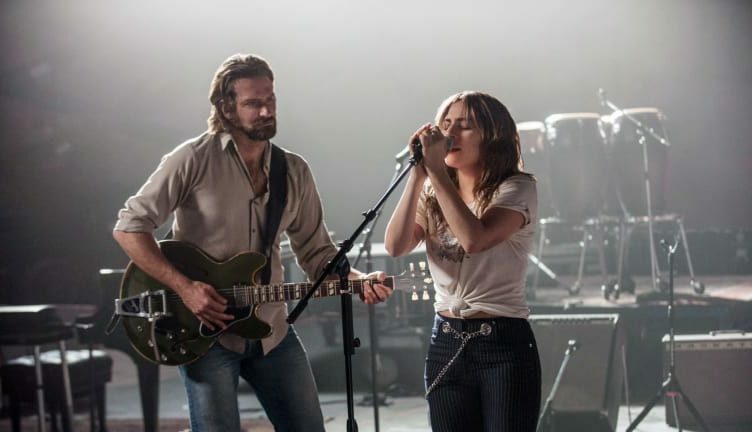 Stripped of all her make up, meat dresses and wigs and looking like quite the Plain Jane, Gaga (real name Stefani Germanotta) plays Ally, a small-time singer who catches the eye and ear of flailing rock legend Jackson Maine. Clearly bored with fame, he’s trying to unwind after playing to an arena of adoring fans. As such he needs to drink heavily, but as well as finding succour in booze he finds solace in Ally, who he clocks as a prospect both as a lover and as a talented singer/songwriter. They quickly bond and hook up, then as his career begins to tumble hers takes off. Tensions inevitably turn the relationship toxic as Jackson morphs from mentor to being an envy-ridden rival who begins resenting the very talent he helped bloom before a global audience. This is the essential outline to the modern-day mythical tale A Star is Born has become, from the original 1937 film with Janet Gaynor and Frederic March, to the 1954 movie with Judy Garland and James Mason and, of course, the venerable if clunky 1976 rock version with Kris Kristofferson and a very highly strung Barbra Streisand. As transposed into the media-driven era of sudden fame and instant shame, the film glistens as a cautionary tale about self-respect, self-delusion and self-destruction, all set to a great soundtrack and grounded performances. For all her bravado, Ally is a fragile character stricken by her love for Jackson, and their conflicts make for some unforgettable moments, the most stinging of which occurs at the Grammys. Indeed, the film can’t be faulted for the punches it delivers about the soul-destroying evils of alcohol, and it’s a credit to Cooper – who co-wrote the film with Eric Roth (Oscar-winner for Forrest Gump) and Will Fetters as well as producing – that he didn’t make the all-too-easy switch from booze to drugs. There’s a rich ensemble cast in support: the wonderfully croaky Sam Elliott plays Jackson’s older brother; Andrew Dice Clay (so good opposite Cate Blanchett in Woody Allen’s Blue Jasmine) is great as Ally’s ever-supportive dad; comedian Dave Chappelle turns up as a friend-in-need of Jackson’s; and veteran Ron Rifkin (who co-starred with Cooper in the TV series Alias) pops up as a therapist. Still, nothing would have worked had the leads not meshed. As the yin to each other’s yang, Cooper and Gaga light up the screen with performances that are earthy and often raw. Some of their most poignant scenes, both tender and barbed, benefit from the use of improvised dialogue and multi-camera set-ups. With a camera trained on each actor, Cooper often captures cutting instances of dark intimacy with great naturalism. We’re now in the run-up to Oscar season, which is where this film is clearly destined. Glad to report, then, that despite its hype-driven pedigree this fourth version of A Star is Born has put its own stamp on one of Hollywood’s favourite myths. And what is especially admirable is how the film’s fidelity to the original bravely extends to that heart-breaking final reel. This must have been a tough ask given that the story pivots on the sacrifice the woman is willing to make for the sake of her man, and how this runs counter to a lot of present-day thinking. Yet it works marvellously. For that, after all, is what love does to you. And if the final scene doesn’t make your eyes go at least a little misty, check for a pulse. For all the ground-breaking realism Ron Howard’s splendid Apollo 13 brought to the cinematic depiction of space flight – especially regarding weightlessness – the one thing that was never really in question was the sturdiness of the spacecraft itself as it stood tall and proud on the launchpad. In First Man the take is slightly different. As astronauts sit in their tiny capsules they are slowly tortured by a discordant symphony of metallic creaks and moans, a brilliant piece of sound design that conveys the ignore-it-if-you-can fact that the towering technological marvels that sent men Moonward were essentially giant, fragile fire crackers held together by nuts, bolts, rivets – and a good deal of prayer. With the visual veracity of a documentary, Damien Chazelle’s superb chronicle of the Space Race that lead to the 1969 Moon landing is a sterling work that goes to extraordinary lengths highlighting the risks these crazy-brave men took in the American quest to conquer space before the Russians. And, of course, not all the rockets withstood the rigours of launch. Nor was the nascent technology foolproof, with some mishaps proving lethal. The film is unflinching in its coverage of the human loss these failures entailed. At the centre of the film’s exacting recreation of events is the personal drama of Neil Armstrong, a modest, consummately professional pilot brought to life by an understated Ryan Gosling, who puts in one of his best less-is-more performances to date. Alongside him is his long-suffering wife Janet (Claire Foy, aka Queen Elizabeth from The Crown) who shares the grief of a family tragedy, but who will not accept Armstrong’s single-minded dedication to his mission over his obligations as a father. The film is stirring in its depictions of the training and the dangers involved in the Moon project, and while its clear purpose is to celebrate the astonishing achievement the Moon landing was – it is timed to commemorate next year’s 50th anniversary – the film does not wear its American pride on its sleeve. Nor is it tarnished by jingoism or cliches, its cliche-averse drama grounded in beautifully judged human moments about camaraderie, family and – dare one say it – love of country. Chazelle, who made a splash with 2014’s Whiplash and won a best director Oscar for La La Land, should be up for another doorstop next year, along with all the other nominations covering the film’s acting and production, especially with special effects and sound. For a film designed for an Imax release, Chazelle and cinematographer Linus Sandgren (Joy; American Hustle; La La Land, which got him an Oscar) have bravely incorporated a lot of close-ups and shakycam, especially during the gripping flight scenes (don’t be late or you’ll miss the nail-biting opening sequence). While these might intuitively go against the Imax format, which loves big, wide production shots, they actually work marvellously well. First Man makes a great companion piece to The Right Stuff, Hidden Figures and Apollo 13. Indeed, it makes one wonder why it took the Americans so damn long to make a major movie about such an historic event. Yet the film’s adulation does come with a double edge: while it justly honours the achievement of the mission, the film also highlights, with unspoken force, how the Moon landings have never been topped. Perhaps under its thrilling, enthralling surface, First Man is also intended as a piece of cinematic rhetoric. As a period film it carries the implicit, back-handed message that perhaps the depth of vision and strength of will needed to make such achievements possible are locked in a bygone era along with the primitive computers and ashtrays of Mission Control. In setting up the various scenarios for his ripper mystery-thriller, writer/director Drew Goddard (he penned The Martian, Cloverfield; World War Z; Buffy) takes his own sweet time. Set in 1969 at the remote El Royale Hotel, built so precisely on the border of California and Nevada that a line runs through the property, an odd assortment of characters slowly assemble in its decadently plush foyer and rooms. Slowly, at first, then with gathering speed, Goddard generates some deftly devised, singularly delicious cross-currents of tension as the secrets of the hotel slowly come to light, all cast in the pall of Cold War paranoia. Spiced by that creepy unease we often find in films by the Coen Brothers or David Lynch – Goddard certainly shares their love of long takes and lamplight – free-floating plotlines gradually interweave until the film’s crazy logic clicks into place. With a great ensemble cast including Jon Hamm (Mad Men), Jeff Bridges, Cynthia Erivo, Dakota Johnson (the 50 Shades girl), Lewis Pullman and Chris Hemsworth – here proving how far from Thor his versatility can stretch – the film is a playful, skillfully conceived mind-bender that grabs hold of you early and doesn’t let up.